When you explore the varieties of nostalgic candy that have endured over the years, malt chocolate balls will be among that collection. They continue to be a favorite movie-time treat, holiday candy and overall delicious, fun candy that kids and adults enjoy. Malt balls have been around for a long time. They originated in England. The original plan for the malted milk powder that William Horlick created in 1887 was to market it as a health food product and as infant formula. However, malt powder usage took a different turn and it began being used as a sweetener. In 1936, Forrest Malt created malt chocolate balls. This totally unique candy quickly gained favor and increased in popularity in England. It wasn’t until 1939 that malt balls candy arrived in the United States. They became popular then and remain a popular snack today. Maltballs get their distinct flavor from the malted milk that is used in the recipe. Malted milk is a mixture of malted barley, wheat flour and whole milk that is evaporated until it forms a powder. Malt is a mixture of roasted nut flavor and caramel flavor. It is often paired with chocolate. Malt balls candy is enjoyed year round. It is among the most popular types of candy purchased during Easter and Christmas. How are Malted Milk Balls Made? The precise recipe and process for making malted balls on a commercial scale are not disclosed in their entirety. However, there are recipes available that guide you through the process of making chocolate malt candy at home. To prepare malt balls candy at home you will need to melt white chocolate in a microwave or double boiler, then mix in malted milk powder until the mixture is a consistency that can be shaped into balls. Some recipe instructions advise that you freeze the malt balls for about 10 minutes before dipping them into the chocolate that will be their outer coating. Whether it’s in a freezer, refrigerator or on the kitchen counter, the malt balls do need to be cool before undergoing the final dipping process. While they are cooling, you can melt the milk chocolate, dark chocolate or white chocolate that you’ll be using for the coating. Allow the coated malt balls to cool completely before storing them in an airtight container. If you’re feeling creative, you can coat the balls in a colored coating that coincides with the holiday or occasion that you are making the candy for. This two stage process likely parallels the commercial process, except on a smaller scale. Industrial cookers, trays and other cooking utensils of larger proportion would be used in a factory setting. Even though the process of making malt balls at home is not exceptionally difficult, it may be an activity that doesn’t fit into your busy schedule. 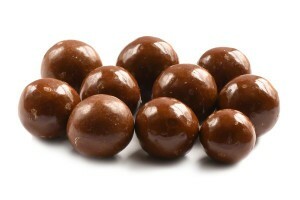 Making chocolate malt balls bulk purchases is an easier way to acquire a supply of this popular nostalgic treat. Bulk buys are also easy on the budget. The shelf life of bulk chocolate malt balls is 6 months. As well-loved as these tasty treats are, there’s sure to disappear quickly. Both dark chocolate and milk chocolate malt balls are a delicious, non-age-specific treat. They’re a candy choice that can be enjoyed throughout the year. They’re a snack you’ll want to have on hand when the family gathers together for movie night or to watch a marathon of a favorite TV show. Nostalgic candy and old-time TV favorites are a perfect combination. This is a candy that guest might not expect to find on a snack-style party table. However, the sight and flavor of malt chocolate balls can immediately bring memories to mind and put a smile on their face. It never hurts to sneak in a little extra nutrition when snacking. Choosing dark chocolate malt balls can give you a boost in the daily value requirements of certain nutrients. A serving of dark chocolate malt balls can add to your daily requirement of calcium, iron, fiber, carbohydrates and protein. Dark chocolate contains beneficial antioxidants and is beneficial to cardiovascular health and skin health. Dark chocolate may also help improve brain function. When eaten in moderation, malt balls can be a beneficial way to satisfy a desire for a sweet treat. Milk chocolate malt balls have a less intense chocolate flavor than those covered with dark chocolate. They could easily be included in a list of comfort food. That is due in part to their nostalgic characteristic. Also, milk chocolate tends to have a soothing quality about it. That’s a characteristic that is required of comfort food. When gift-giving occasions come around, gifts that revive childhood memories are often the most treasured gifts. Nostalgic candy can stir happy memories, especially for seniors. Family and friends who love chocolate would most likely appreciate the opportunity to enjoy the goodies in a tin filled with chocolate covered items such as malt balls, nuts and coffee beans. Whether presented in the form of a gift tin or packaged in attractive bags, chocolate malt candy makes a wonderful gift that is appropriate for almost any occasion.